it’s been a while since I wrote anything but school assignments. It can wear a girl out doing all the school work. I am enjoying it for the most part. I’m learning a lot of new stuff and realizing I already know a lot of stuff. It makes me feel like I’m not a complete idiot and maybe I’m going in the right direction. The problem with doing homework every waking moment is that the days tend to blend together. When I’m working it’s easier to keep my days straight, but this week we were on Fall Break so….I feel like I’m lost in space. I didn’t even have any television shows to guage the passing of time. Our family went ‘no tv’ for the week in preparation for Conference this weekend. It was really nice having a quiet house all week. We played games, went for walks and bike rides, and ate at the table together. The kids didn’t complain much at all. Ben was the one who ‘suffered’ the most, he was “bored” all week. I finally told him if he said that word again I would pinch his rump 47 times. Of course, that turned it into a game and he said it even more. Silly boy. I don’t really remember the last time I was ‘bored.’ I remember feeling that way back when I was a teenager and didn’t want to do my chores, but other than that…life is too full of stuff to do to be bored. There may be times when I have so much to do I just sit and looked stunned because I can’t figure out what to do first, or times when (gasp) I’m all caught up on jobs and can catch my breath, but those don’t happen often. Most times I just go on to the next thing on the list. Ben likes to be entertained or DOING something all the time. He is a smart guy that has a big sponge to fill so I don’t blame him. He got a lot more comfortable calling friends to play this week. It was a good time for him. Some people fill their time differently than I do. I have friends that party and go to the clubs and slosh around a bit. I don’t really have any desire to do any of that. I like live music, but I prefer to hear it without having beer spilled on my boots. I might have missed out on a really good time today. I saw a sign in front of a house in my mother’s neighborhood that said, “White Trash Jamboree #6″….spray painted with flair on a piece of plywood. I was tempted to pull over, but I had my girls with me and figured it might not be their thing. What does one do at a White Trash Jamboree? 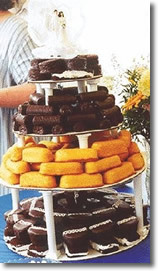 Visions of cakes made from Twinkies and bellies hanging over belts make me want to get out my camera….not for posterity so much as for comic relief when life gets too serious. Is that a bad thing? Hey, laughter is good medicine…and I wouldn’t laugh in their faces…..cause I said so. This entry was posted in Beckie and tagged boredom, conference, kids, mom, twinkies, white trash. Bookmark the permalink. thanks for the smile Becki! thanks for the smile Beckie!